Known as one of Californias greatest lakes, Shasta Lake provides year round fishing for many species, but for me, the big rainbow and brown trout are the fish I target regularly. This trout fishery has become my top venue for people looking for a great fishing experience and has become the number one body of water I’m booking trips on. My November calendar begins to fill with bookings that are primarily designed around chasing big brown trout that are migrating to their spawning grounds, but we also have some great rainbow trout fishing to keep things interesting as well. Shasta Lake is a deep water fishery in the summer months which usually starts around June, but as fall sets in, cooling water temperatures in Shasta begin to change the thermocline where warm water above meets cold water below. As Shasta Lake surface temps begin to drop, natures signal for the fall turnover of the lake begins. Cold water has a higher density than warm water and will therefore push through the warmer layers of water in the lake. As the warm and cold water in the lake begins to mix, the warm water will be displaced and the thermocline will disappear. This will eliminate the the need to go down deep to find the trout in the cooler water because the whole lake will drop into the 50’s. This creates a cool environment for the trout near the surface where most of their food chain lives. Fishing during this change in the lake in October can be difficult, but as November appears, the lake will have turned and the trout will have settled into their new environment until summer warms the Shasta Lake water again. Shasta Lake has an abundance of quality browns in the 7-9 lb range like the one pictured. Fall through spring is my favorite time to fish for trout in Shasta Lake, primarily because I can troll the top 15’ of the lake and find success on every outing. Both rainbows and browns can be found among these depths regularly during the cold water months. Because I’m trolling near the surface, the use of downriggers isn’t necessary. This makes the angers who fish from vessels that aren’t equipped with downriggers happy because it gives them a shot at some of the great trout in Shasta Lake they can’t reach in the summertime. 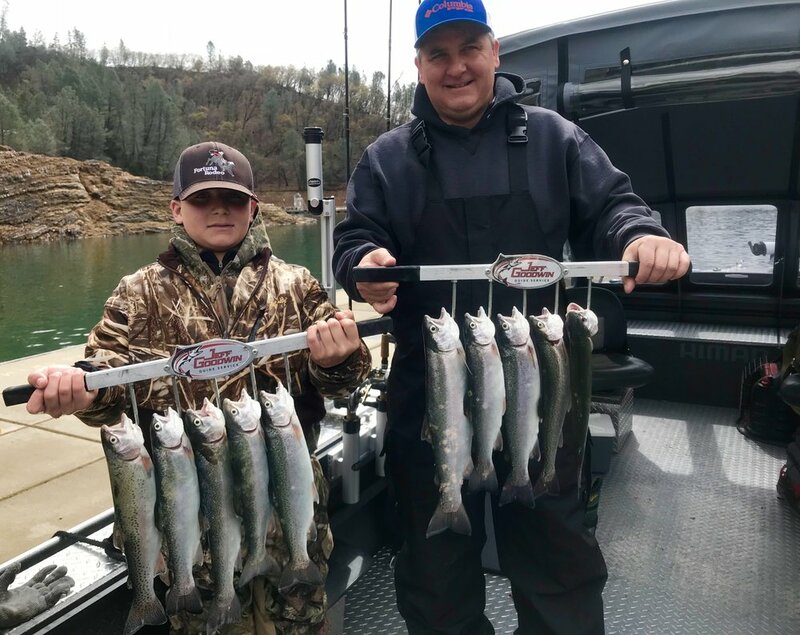 CDFW trout plants begin in the cooling water months like October, so for those of you with small watercraft, trout fishing around the boat launches on Shasta Lake can be quite productive and you don’t have to venture out too far to find them. I have two plans in mind when I head out on Shasta Lake, but its the clients request that drives me in one direction or another. Most of my clients want to target big fish and thats understandable because so do I. Shasta Lake offers some exceptional brown trout specimens, especially during the cold water periods, so we target big browns regularly. The name of this game though, is quality over quantity. When targeting big, weary brown trout, you’re only going to get so many bites in a day. Some days are better than others of course, but patience has to be a part of your mindset when chasing these great fish. Many of my clients are looking for that one big brown for their bucket list or even just a brown trout period. Most days we can deliver the browns, but sometimes we have to divert our attention to the rainbows to keep the day moving in the right direction. We can catch Shasta Lake rainbow trout when the brown trout bite is off. When fishing for big browns in the fall/winter/spring seasons I use many techniques to find success. Getting the lures away from the boat is very important so that means long setbacks off your downriggers and or side planers. This helps in a big way, especially when the lake is flat and glassy. When fishing in flat/glassy conditions, I also look to drop my lures down a bit as well. Some days when the sun is high in the sky and the surface is glassed over, the fish tend to push down into deeper water to dim the sunlight. Downriggers work great for that, but so do the Trinidad Tackle Eco Weights. No special gear needed for the Eco Weights, just let out 50’ of line and pinch them on. Finish letting out more line until you think you are getting down where you need to be. I have three top producers that I use almost every day when trolling for big browns. The three of them used alone or in combination with one another usually spell success for me on Shasta Lake. I troll big spoons like the Trinidad Tackle Co. Optimizer spoons, Bay Rat Lure stick baits like the long shallow divers, and the Arctic Fox Trolling Flies. I’ve invested a lot of time in these three brown catching presentations and my clients have caught tons of fish with them. I will change sizes and colors on some days when I’m finding a tough bite, but I’m still running the same three products. Let the fish tell you what they want. All you have to do is put the right lure out there at the right time and you’ll get your bites. When the browns just won’t cooperate, sometimes I have to go to plan “B” and go after some rainbow trout. I’m not talking big trophy rainbows, because thats a summer thing. There are rainbows all over the lake, but I have found that the non spawners will winter in the arms of the lake in cooler water. The lower end of the lake does hold fish, but if you want limits style fishing you need to get away from the big water. Having access to these 14”-16” rainbows all winter can be a day saver for sure. All you have to do is go up and find them. I use the same three presentations mentioned earlier, I just size down. So thats just a few bits of information about fishing Shasta Lake in the cold water months. Of course theres way more involved in finding success daily on Shasta Lake, but these are a few of the key points to help you all find that big brown trout this fall, winter, or spring. We hooked into some very heavy browns this year so we know there are some real trophy fish swimming around in Shasta Lake. Keeping this in mind, my last piece of advice would be this. When fishing for big fish, make sure you have the gear to handle one. Running light leaders and 7’ Kokanee rods will certainly catch fish, but landing them is a different story all together. We got lucky and landed a 10.5 lb. brown on a Shimano Kokanee rod this spring. Many other times we lost big fish to soft hook sets and not enough power in the rod to get them up to the surface. When you hook into that fish of a lifetime, you’re gonna wish you had the gear to get it to the net. Mark is locked up on a trophy brown that came in at 10.5 lbs on a Shimano Telora Kokanee rod. I’m running brown trout trips November through early summer this coming year. If you would like a shot at a trophy Shasta Lake brown trout or would like to learn a bit more about fishing for them on your own, please send me a contact message or feel free to give me a call to set up your trip. I have a two person minimum and like to fish a maximum of 4. I can fish up to six anglers, but there can be long periods in-between fish with that many people taking turns fighting fish. If the conditions are right we will catch some nice fish. If not, we’ll re schedule another trip when the fishing has picked up again. Tight lines and I’ll see you on the water! Newer Post700K more fall Kings for the Sacramento River! Older PostSacramento River salmon are here!